It offers everything we have packaged into our new Gallium but with the added braking power of disc brakes. The Gallium Disc is a true all-arounder. 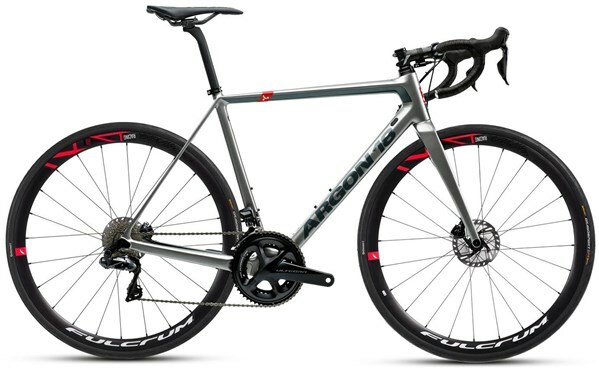 It is meant for a new generation of serious and budget conscious cyclists who look for the best high performance road disc bike that money can buy. Same geometry as the Gallium Pro Disc - A World Tour caliber race bike. All-around road and climbing bike - For a great riding experience and superior braking power. High performance monocoque carbon frame - With riveted aluminum front derailleur hanger Designed for flat mount discs. Replaceable rear derailleur hanger - Optional direct mount hanger supplied. Up to 28C (30mm) tire clearance - For maximum comfort and compatibility. Refined 27.2 seatpost - Easy-to-use, offers more compliance, adjustability and comfort. DT Swiss type 12mm thru-axle - Clean, simple, light and sturdy. Inlaid chainsuck protector - Protection of the carbon chainstay against wear from the chain’s movement.